The Office of Study Abroad is starting weekly study abroad information sessions led by recent Webster study abroad alums called Study Abroad 101. They will be offered multiple times a week. 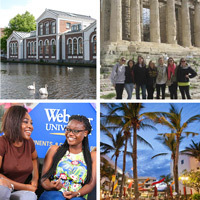 Study Abroad 101 gives you all of the basics for studying abroad with Webster. Learn everything from different campus options and destinations, to financial aid and scholarships, to starting your online application. If you’re interested in study abroad and aren’t sure where to begin, let Study Abroad 101 be your starting point to the experience of a lifetime! 101s are a great first step for students who are interested in learning more about study abroad opportunities. Right now, a full list of 101 dates in February 2018 is available on the study abroad website. March and April dates will be posted shortly.